Other: Spellbinders Double ended tags, die cutting machine, red brads, sewing machine, crochet lace, lace, cream seam binding, watercolor paints, Webster's Pages embellishment. awww...this is totaly sweet! Love that image, and the papers look so scrummy!!! this is so beautiful, Clare! love the design! This is wonderful! I love the card front design - brilliant! That is just THE Cuuuuutest card. Love it!!!! This is lovely! The papers really work well together, and the lace is scrummy! An amazing combination of a perfct LO, breathtaking papers and brilliant use of this weeks'colors. I love this; it's absolutely fabulous! What a whimsical card! 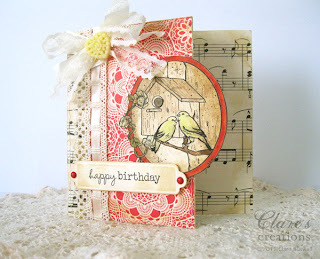 I love the music, ribbons, background paper and birds. It all ties together so beautifully. 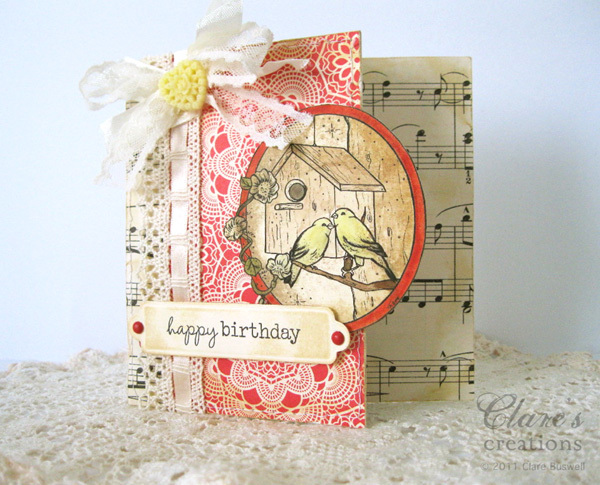 Love the birds and musical paper! Love the lace, ribbon, and heart embellishment...so lovely!